A late 18th century ivory and gold mounted bodkin case of cylinder form, with engraved gold band and four gold studs, complete with white metal bodkin. 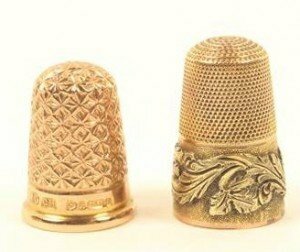 Two gold thimbles, comprising; an early 19th century example with frosted frieze and raised scroll leaf frieze, and a 9ct gold thimble. A pair of early 20th century butterscotch amber drop earrings, similar faceted pair, carved mother of pearl pendants , gold ring and other items. 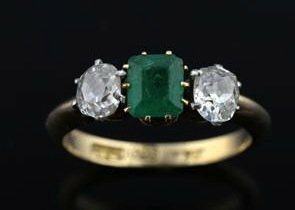 An early 20th Century emerald and diamond three stone ring, square step-cut emerald to the centre weighing approximately 0.60cts flanked by two old cut diamonds weighing approximately 0.40cts each, mounted in 18 ct gold. 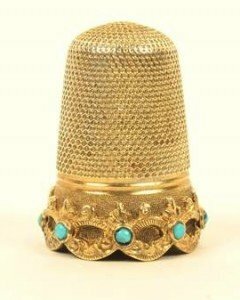 A Victorian gold thimble, the frosted frieze with raised leaf ovals and set with eight turquoise coloured stones over an undulating rim. 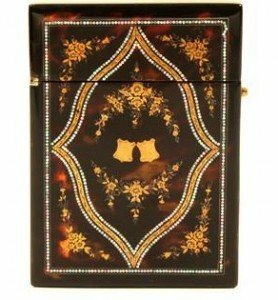 A fine tortoiseshell and inlaid visiting card case, circa 1840, hinged top, one side with gold pique of flowers with two central shield cartouches within dot work borders of mother-of-pearl, engraved gold border. 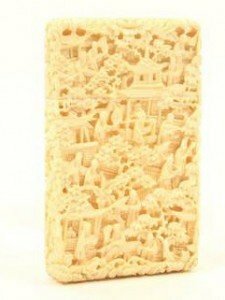 A fine Canton carved ivory visiting card case, circa 1820, the case with pull-off cover, the whole finely and deeply carved with pagodas, figures, a boat and foliage, signature to edge of upstand. 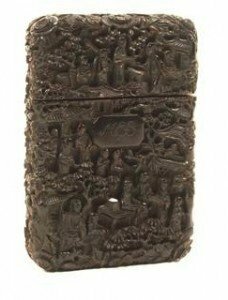 A carved Canton export tortoiseshell visiting card case, circa 1830, pull-off top, the whole deeply carved with figures, pagodas, trees, a boat, tea table and other subjects. 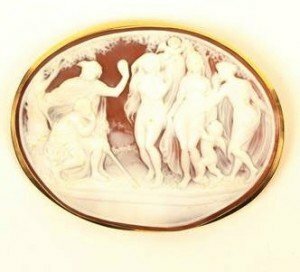 A large gold mounted cameo brooch, the shell carved with a group of three naked women with two attendant cherubs, with a shepherd and another figure by a tree. 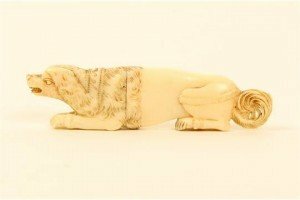 A fine Palais Royal carved ivory needlecase, in the form of a crouching dog, the tail pierced, the underside of the feet with well carved claws and other details, the collar studded in gold. 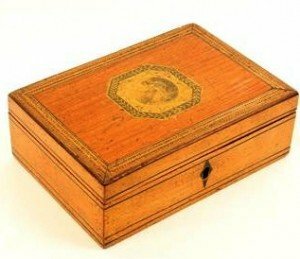 A Tunbridge ware mahogany sewing box of rectangular form, the lid in cube work within a cross banded and boxwood line border, the lid interior in watered blue silk over a blue and gold star paper covered tray with blue silk lids, the tray fully fitted with pincushions, needle books, tool cards, etc. 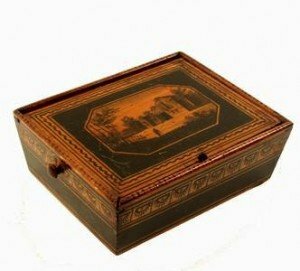 A Regency painted whitewood sewing box, possibly early Tunbridge ware, of sarcophagus form, the lid brightly painted with rural buildings within decorative painted borders, the sloping sides with a broad floral border between red and black borders. 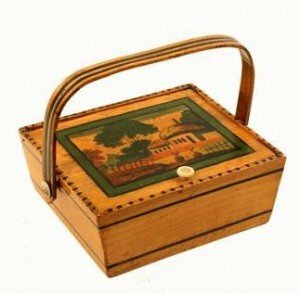 An early painted Tunbridge ware small format sewing pannier, line painted sloping sides with pin hinge rectangular lid painted with a rural landscape, bone knob below a swing handle with turned bone mounts, pink paper lined compartmentalised interior with print to interior of lid. 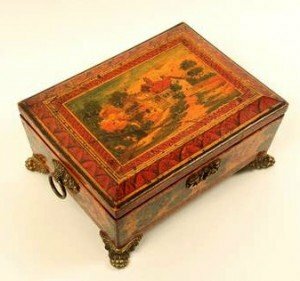 An early painted Tunbridge ware small sewing pannier, the sloping sides with geometric painted decoration, the pin hinge lid painted with a ruined rural building and solitary figure within multiple borders, compartmentalised interior, with side mounts for a swing handle. 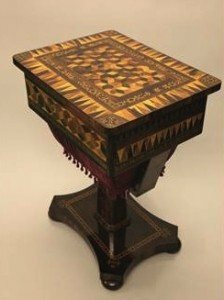 A fine rosewood Tunbridge ware sewing table, the overhanging hinged top with a central panel of cubes within a stick ware border and an outer border of vandykes, with square stick work panels to the corners, the sides with panels of cube work within stick ware borders and fitted to each short side with a drawer, the interior with an elaborate compartmentalised and lidded tray lined in pink paper. 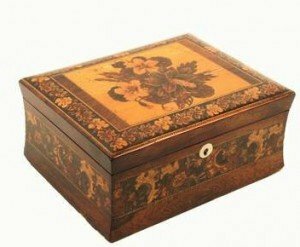 A Georgian whitewood rectangular box, probably early Tunbridge ware, the sides with painted lines and diamond escutcheon, the veneered lid with a central octagonal print of a classical woman, within outer multiple inlaid borders. 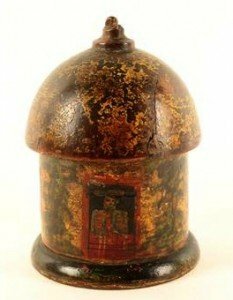 A money box in the form of a circular cottage, painted in the Tunbridge style, thatched roof with damaged chimney, sides painted with doors, windows and plants, a figure at one doorway. 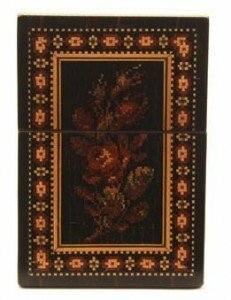 A good Tunbridge ware rectangular visiting card case, pull-off cover, each side with a floral mosaic spray within geometric mosaic borders, the edges also in geometric mosaic. 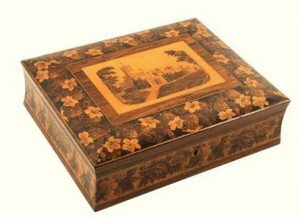 A Tunbridge ware rosewood rectangular box, the concave sides with a broad band of floral mosaic, the cushion form lid with a floral mosaic bouquet inset in whitewood within a floral mosaic border. 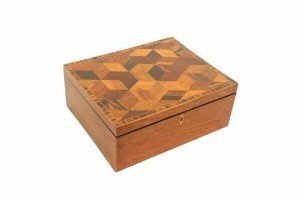 A good Tunbridge ware rosewood games box of rectangular form, the concave sides with a broad band of floral mosaic and inset circular escutcheon, the cushion form lid with a central mosaic panel in whitewood of Eridge Castle within a broad border of floral mosaic, lid interior in blue silk over a compartmentalised paper lined lower section complete with a fitted cribbage board, with floral mosaic panel and stickware knob.